Vampire hunter Captain Kronos (Horst Janson, left) with his beautiful female companion Carla (future Bond girl Caroline Munro, right). The movies by British studio Hammer Film Productions might be among the most fondly remembered shockers in the history of cinema. Some of them have even held a cult status in fan circles for decades and made their leading men and women world-famous. 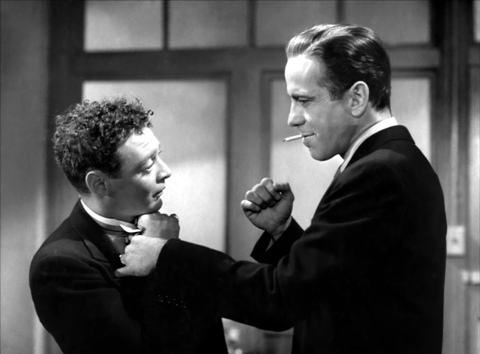 Sam Spade (Humphrey Bogart, right) uses his very own investigative methods on the sneaky Joel Cairo (Peter Lorre, left). Nowadays, devious investigators must be considered an integral part of the Hollywood repertoire. That wasn’t always the case. Their archetype is a guy named Sam Spade, who first appeared on the big screen in 1941. At the time, the character created by writer Dashiell Hammett had already been immensely popular as the hero of the crime novel The Maltese Falcon. Sloane Peterson (Mia Sara, left), Cameron Fry (Alan Ruck, center), and Ferris Bueller (Matthew Broderick, right) enjoy their day off.